'Last Week Tonight' host offered explainer on the potential impacts of Britain leaving the E.U. 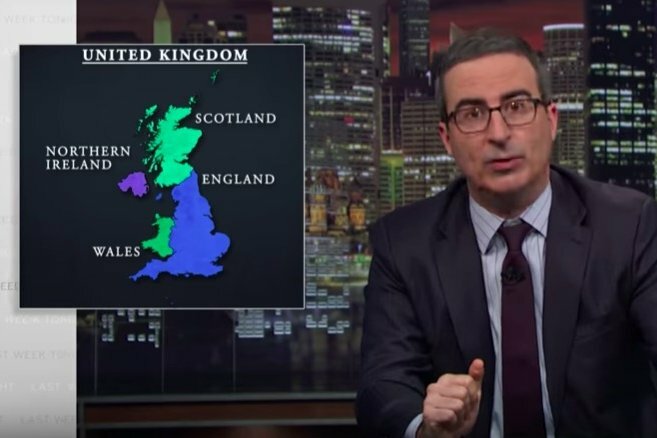 John Oliver delves into Brexit for the third time as the United Kingdom nears the start date on the latest "Last Week Tonight." After a three-month hiatus, John Oliver returned Sunday for a new season of "Last Week Tonight," focusing for the third time on Brexit, which is scheduled to begin March 29. While Great Britain is meant to begin its first stage of transition out of the European Union on that date, the rejection of British Prime Minister Theresa May's Brexit deal has made how that shift will occur far more nebulous. It could have big ramifications for Europe and the world, according to Oliver. The host delved into what went wrong with May's deal, what will happen if the U.K. leaves the E.U. with no deal, and whether Brexit can be avoided entirely. While Oliver unraveled the complications facing Brexit and the potential disaster that awaits, he noted, "Normally for people to be that certain that something will be a disaster, they need to see Will Smith in blue face," a joke referring to the new 'Aladdin' trailer featuring Smith as the Genie. Oliver explained the implications Brexit could have on the Ireland/North Ireland border, particularly when it comes to trade and the transport of goods – perishables and medications could be most in danger. "Medicine shortages are not a problem that Britains expect to deal with," Oliver said. "They're used to having their problems limited to hearing Americans mispronounce the word 'vitamin,' not having enough beans with your breakfast, and having to wait 20 years for another royal wedding." Check out Oliver's Brexit explainer in the clip below, and make sure to catch the boy band "driven to re-unite Great Britain with the EU," the Breunion Boys, at 15:03.